Namibia is one the world's favourite travel destinations. While organised coach tours work for some people, others prefer the freedom of self-drive holidays, preferring to explore the country in their own time, focus on their own particular interests and stay at their preferred type of accommodation. It also provide travellers with the opportunity to slow down and explore this wonderful country at their leisure. Get to enjoy the scenery and friendly locals. 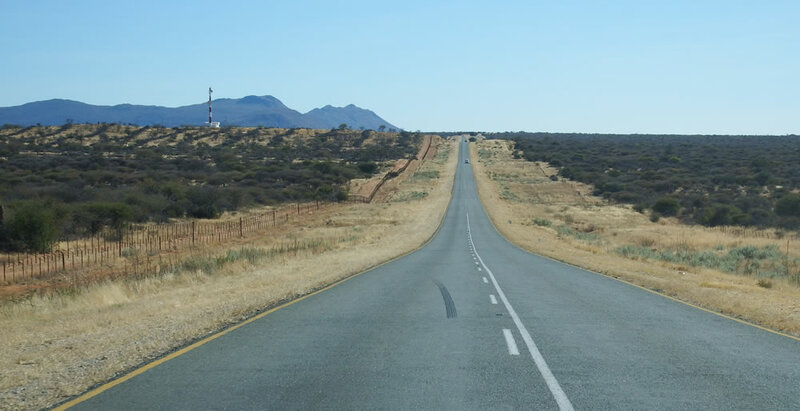 The national roads of Namibia are all labelled with the letter ‘B’ and you can use them to get to most major destinations in the country. These roads are all tarred and maintained and are in general in a good condition. Picnicspots are plenty and well kept on all the main roads. 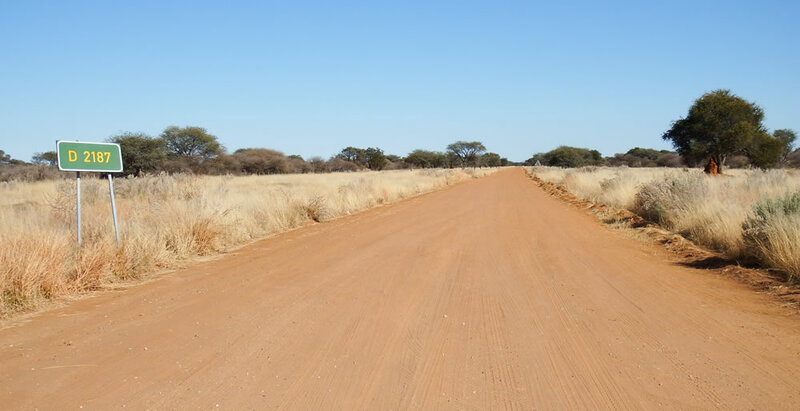 Namibia's secondary roads are identified by either their ‘C’ or ‘D’ prefixes and these roads are mostly un-tarred dirt roads. These roads are more often than not well-graded and easy enough to drive on, but bear in mind that you will need a car that can handle a little bit of sand and dust when using some of them. If you are unfamiliar with driving on dirt roads, take the trouble to to familiarise yourself; see the section on "Dirt Road Driving" at the bottom of this page. 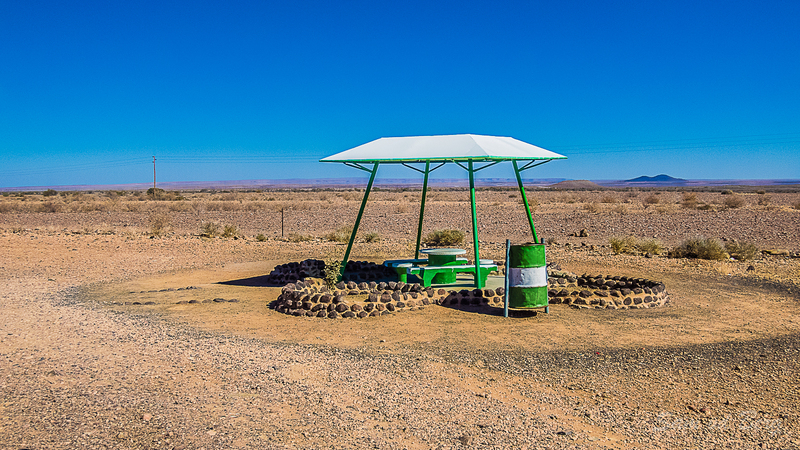 When you begin exploring Namibia’s secondary road network in earnest you will find loads of little gems hidden along the way. Quiet rest camps, conservation centres, traditional communities, forgotten graves and even the largest meteorite in the world! No matter what road you’re driving on, highways or side roads, you always need to be on the lookout for animals, not only because they are amazing to spot and observe, but because they may run into the road unexpectedly. 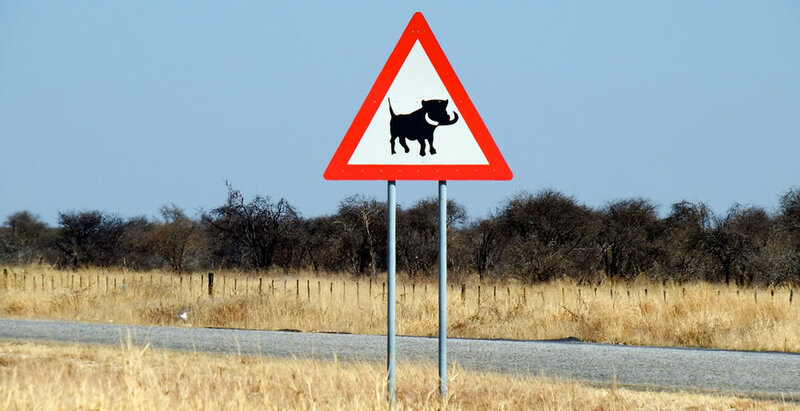 Warthogs can be particularly dangerous as, being small, they are relatively difficult to spot from a distance and, being solid, will cause serious damage to your vehicle if hit at high speed. Kudus and other antelope can also panic and run in front of cars so be aware, especially if you see road signs warning of the likelihood of encountering one of these animals. The animals are most active at dusk and dawn so, if the sun is rising or setting,keep a close eye on the verge of the road. A car handles differently on a dirt road than on tar. If it’s your first time driving on dirt, begin carefully and see how your car stops, accelerates and corners. Cornering. Maintain an even speed as you corner and try to avoid accelerating/braking in the corner. Do your braking before the corner. If the road is corrugated it require special care. Sand. Watch out for sand on the road as deep or loose sand can bog a car down, even larger 4×4s. Tyres. Ensure your tyres are at the proper pressure. On gravel it is usually neccesary to reduce tyre pressures to ensure a larger foot (or rather tyre) print. 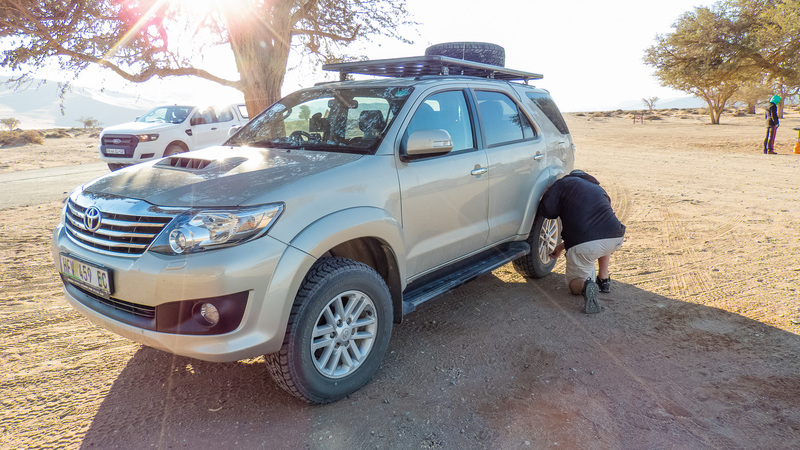 Distances in Namibia are great and petrol stops often far apart so at every petrol stop have your tyre pressure checked, as well as the oil and water. Flat tyres can happen at any time or place and you may be far from the nearest help. If possible, have two spare tyres and ensure you know how to change them! Travelling a dirt road takes longer to reach your overnight destination than on a tarred national road so allow for the time factor when planning your trip.